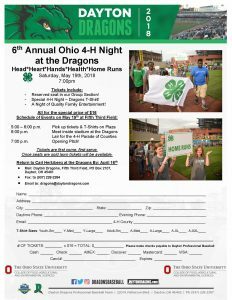 Don’t miss out on another great year of the Ohio 4-H Night at the Dayton Dragons. This is the 7th year of this partnership. The game will take place on Saturday, April 27 at 7:00 p.m. The cost is $16. You get a ticket and a 4-H/Dayton Dragons shirt. In addition, you can participate in a parade of counties. We are working closely with the Dayton Dragons to see if 4-H families can participate in some games during the game too. They would love to have a 4-H member sing the National Anthem at the beginning. If you are interested, please let us know and I will get you the details. Feel free to share the order form with all. We also have plenty of copies here at the office for pick up. Tickets need to be postmarked by March 29. You can drop it off at the office or mail directly following the directions on the form. The game will take place on Saturday, April 27 at 7:00 p.m. The cost is $16. You get a ticket and a 4-H/Dayton Dragons shirt. In addition, you can take participate in a parade of counties. We are working closely with the Dayton Dragons to see if 4-H families can participate in some games during the dame too. They would love to have a 4-H member sing the National Anthem at the beginning. If you are interested, please let us know and I will get you the details. 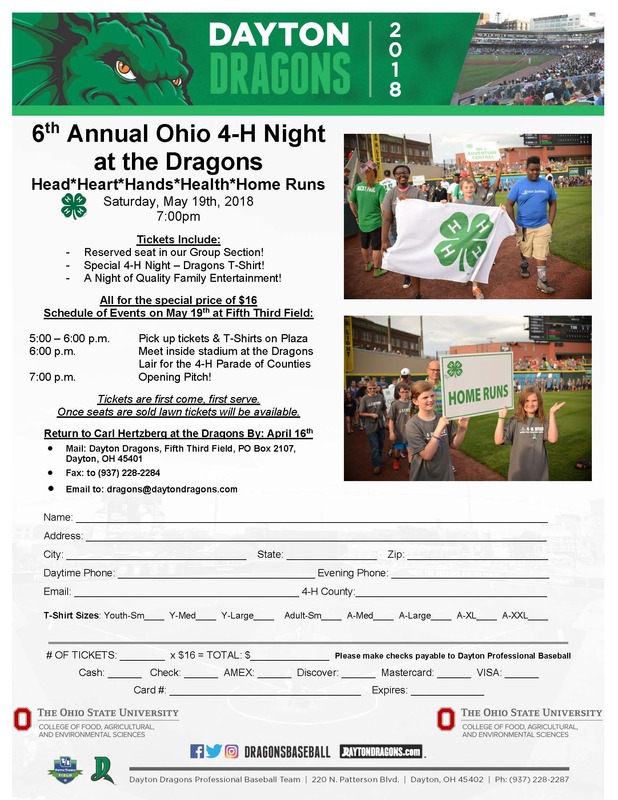 Last call for Ohio 4-H Night at the Dayton Dragons! Join us for a fun evening on Saturday, May 19. The game starts at 7 but the fun will start before with a parade of counties. Please call Carl at the Dayton Dragons to order tickets. His number is 937-228-2287 ext. 160. Go Dayton Dragons and go Ohio 4-H! The Dayton Dragons and Ohio 4-H are proud to announce that there will once again be a 4-H Night at Fifth Third Field this upcoming season. Over 500 people came out to support 4-H Night last season, and we would love your support to surpass that mark this year. This year’s event will be on Saturday, May 19th, 2018. The festivities will begin at 5:00 PM, where folks can begin picking up their t-shirts and tickets. At 6:00PM we will head into the stadium to begin lining up for the on-field pre-game parade with all 15 counties. This was very cool last year, and we are excited to make it bigger and better for this year. 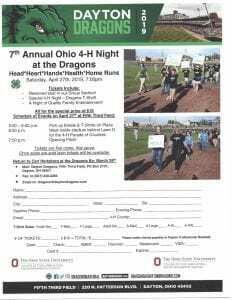 If you are interested in participating in 4-H Night at the Dragons once again, please fill out the enclosed order form and return it to the Dragons at PO Box 2107, Dayton, OH 45401-2107, fax it to (937) 228-2284, e-mail it to carl.hertzberg@daytondragons.com, or give him a call at (937) 228-2287 ext. 160. Final deadline to order and receive a t-shirt has been extended to Friday, April 20th. The t-shirt order will be placed Monday, April 23. We hope to see you back out at Fifth Third Field on May 19th, for our Sixth Annual 4-H Night! Join hundreds of other 4-H families from across the state at a fun Dayton Dragons Baseball Game. Ohio 4-H Night is May 19. Here is the order form. 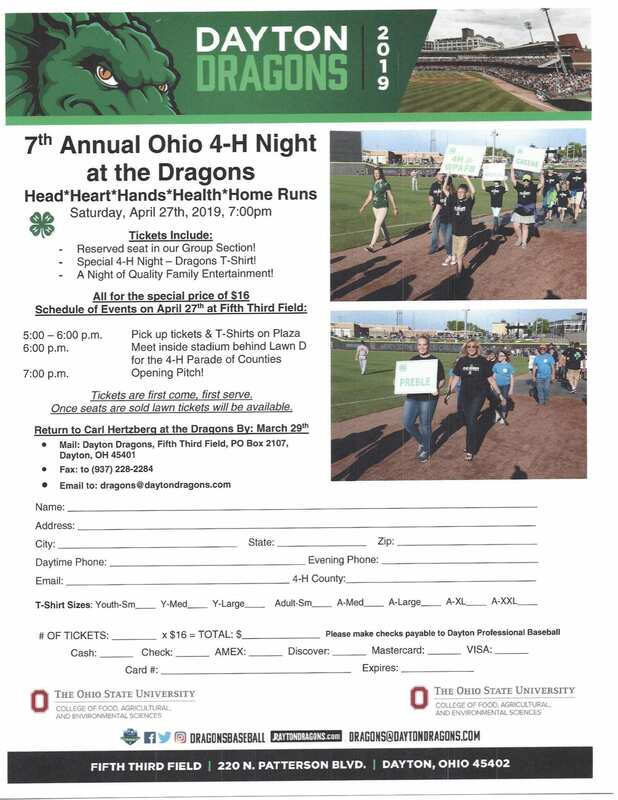 Tickets are $16.00 and that includes a special Ohio 4-H Dayton Dragons Shirt! There is a parade of counties on the field before the game starts. Hope to see you at the game!